The world’s first complete 3D printer-generated heart, made using the patient’s own cells and materials, has been created in a lab. “This is the first time anyone anywhere has successfully engineered and printed an entire heart replete with cells, blood vessels, ventricles and chambers,” said team leader Tal Dvir. The printer-generated heart is only about a third the size of an actual human heart — and it doesn’t actually work. But it’s a groundbreaking step toward engineering customized organs that can be transplanted with less risk of rejection. NASA’s MMS probes, which use GPS signals to orbit Earth in tight formation, have just shattered the record for long-distance GPS navigation. The four probes recently located themselves 116,300 miles above Earth’s surface, surprising experts who once thought that GPS could function no higher than about 22,000 miles. “When we began the mission, we had no idea high-altitude GPS would be such a robust capability,” says Trevor Williams, the MMS flight dynamics lead at NASA’s Goddard Space Flight Center. 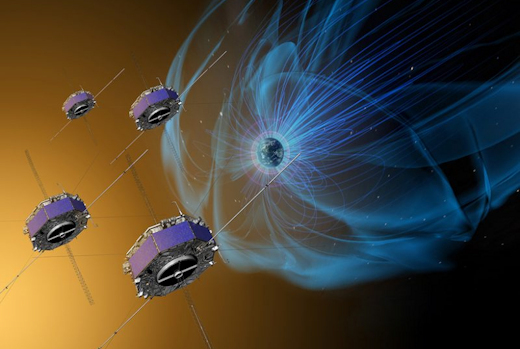 Can Humans Sense Magnetic Storms? Schematic drawing of human magnetoreception test chamber at Caltech. This diagram was modified from the figure “Center of attraction” by C. Bickel (Hand, 2016) with permission. Under the forests of New York and New England, a hidden tracery of tumbledown stone walls marks the boundaries of early American farms, long abandoned for city jobs and less stony pastures in the West. These monuments of an agrarian past also mark past locations of Earth’s itinerant magnetic north pole, a record leveraged by geochemist and local history buff John Delano to reconstruct a history of our planet’s magnetic field in eastern North America in a new study published in AGU’s Journal of Geophysical Research: Solid Earth. An old stone wall marks a boundary of a long-abandoned farm near Grafton, New York, once part of the colonial Manor of Rensselaerwyck. A section of the 700,000-acre manor west of the Hudson River was was surveyed for rental allotments in 1787. Nanotechnology may soon give humans infrared vision, according to a new study that successfully achieved this with mice. This could open up a new door in human infrared technologies with applications extending to security and military operations, scientists from the University of Science and Technology of China said. The study, published this week in the journal Cell, documented how mice were able to see infrared light for up to 10 weeks after being given a single injection of nanoparticles into their eyes. Humans and other mammals are only able to see certain wavelengths of light called visible light. Both ultraviolet and infrared light falls outside of this range. Infrared radiation is all around us, emitted from people, animals and objects. One of the most significant challenges of the 21st Century is how to sustainably feed a growing and more affluent global population with less water and fertilizers on shrinking acreage, despite stagnating yields, threats of pests and disease, and a changing climate. Recent advances to address hunger through agricultural discovery will be highlighted at this year’s annual meeting of the American Association for the Advancement of Science (AAAS) at 8 a.m. Feb. 16, 2019, at the Marriott Wardman Park. “The meeting this year is about ‘Science Transcending Boundaries’–the idea for the session is to highlight research that is transcending scientific and knowledge boundaries, with the ultimate goal to transcend geographic boundaries and reach smallholder farmers in Africa,” said Lisa Ainsworth, a scientist with the U.S. Department of Agriculture, Agricultural Research Service (USDA-ARS) and an adjunct professor of plant biology at the University of Illinois. Recently, Ainsworth was awarded the 2019 National Academy of Sciences Prize in Food and Agriculture Sciences.